Man, where are the rest of the manufacturers who signed up as launch partners? The country-by-country breakdown is interesting. 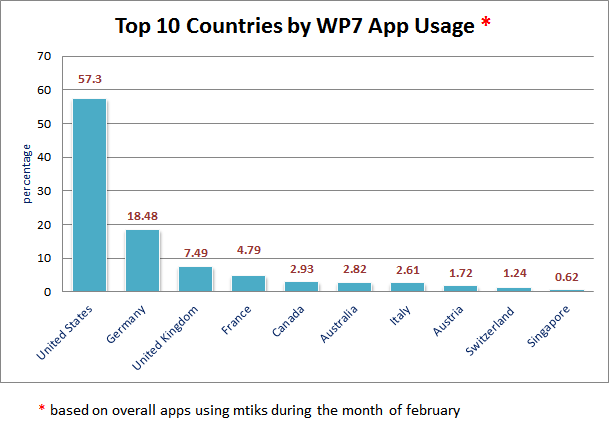 Given the effort Microsoft put into Europe at launch, I’m surprised the USA is still more than half of all users, but the market share devoted to the EU is still substantial. As always with this sort of analysis, you should be critical about what isn’t said: how they gathered the numbers, and how big the sample size is. I don’t see my Dell Venue Pro. Btw, I love this freaking phone. My buddy and his wife finally upgraded to a smartphone and so they got a couple of iPhones. After showing me his and playing with it and then playing with my Dell Venue Pro, he simply goes ” dude that’s a seriously nice phone and that Windows OS is awesome. My wife talked me into these.” it was too funny. But from the screen to the menus to the fluidity to features, my Windows Phone just killed his iPhone. Most people want an IPhone because it’s an IPhone and nothing else. They know nothing about it or how it rates, it’s an IPhone so it must be better than all phones and it’s not. 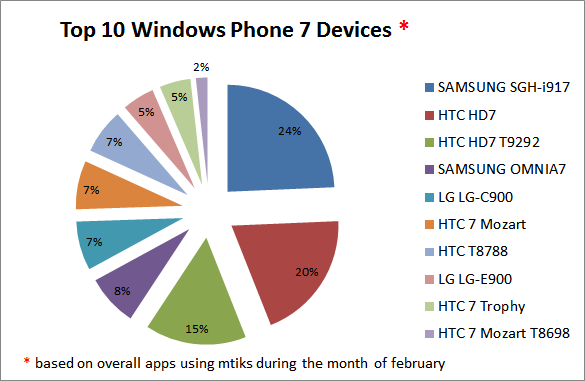 Very few people know about WP7 and that’s because of their ads are so poor. You know more about Geico or tooth paste more than about WP7. It’s all in the advertising.